Dessert was a superb, dense chocolate mousse, with caramel ice cream, and red fruit sauces. 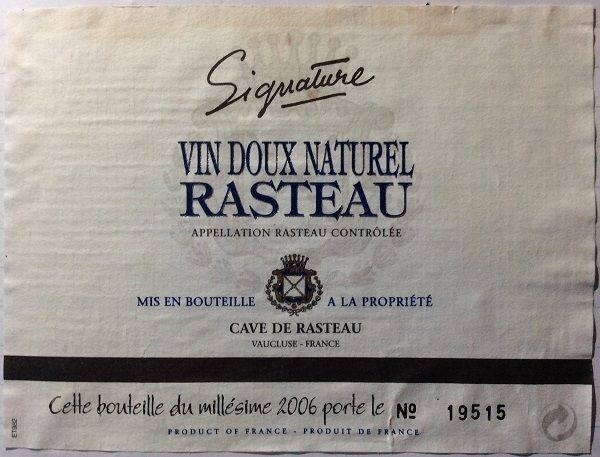 After an initial thought of tawny Port to match this, I rapidly switched to this Rasteau. It was the food-wine match of the night. Deep ruby-black colour with a narrow rim. Intense, vanilla-laced, jammy, dark-berry fruit: blackcurrant and blackberry, and some damson. Some chocolate notes, and lots more vanilla. Soft, round, sweet, milk-chocolate-covered strawberries and blackberry jam. Ripe, soft tannin. Just enough balancing acidity. Very enjoyable and very well made – clean and modern.